It is believed that Lord Vinayaka self-manifested at this place. This temple was built during the reign of Chalukya Kings in 1200 AD. As per the local folklore, 200 years back i.e in 1850 AD, villagers discovered the Idol and tried to move this Idol to the nearby Siva Temple. Villagers were not able to unearth the Idol as a whole as the trunk was so long. After rigorous effort, they stopped exploring for the base. The place where the villagers made the last trails named it as Enugu Bodhe which is now called by Patha Cheruvu. This temple was built during the reign of Chalukya dynasty in 1200 AD. Later this temple was renovated in 1956 AD. 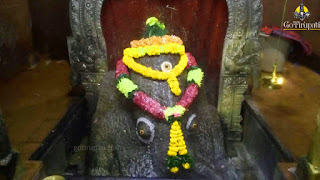 This is the second temple AP where Lord Vinayaka is believed to be Swayambhu. Worshipping the deity yields good results in the work. It is said that hurdles will be removed and will be blessed with good fortune.